When I made the black eyed bean fritters from Cafe Flora last weekend, I realised that I’d hardly made anything much from that book. I have even eaten at the restaurant when we were in Seattle on my birthday last year. To tell the truth I’d been looking forward to going there so much and I was a bit disappointed. There was nothing wrong with anything we ate but it simply didn’t have a wow factor about it that I’d expected. I’m not sure if that has influenced my subconscious to ignore the book but something has! I decided to cook at least two dishes from the book over the weekend so I could give it a good test and see what I thought. No tweaks, no alterations. In fact, I ended up cooking four dishes! 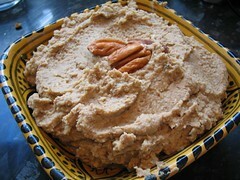 First up was the lentil and toasted pecan pate which I had with toast. This was probably the biggest revelation of the weekend. It was amazingly un-lentilly, dense and meaty. It was also my chance to open the umeboshi paste which I bought for something years ago and promptly forgot what. This got better as it sat so if you planning to make it do it in plenty of time. 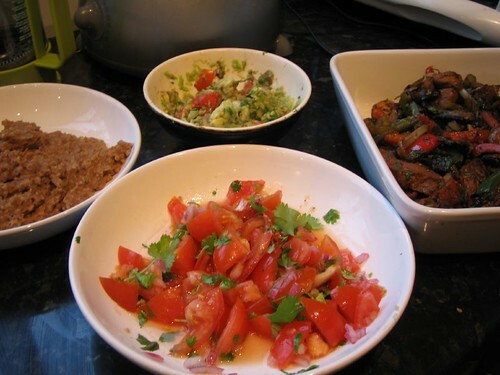 Next on the list was seitan fajitas with pico de gallo, guacamole and chipotle pinto beans. I have made all of these dishes before but i stuck firmly to the ingredients and quantities in the book and it was really good. The seitan was marinated, then fried, then put back in the marinade and fried again. It gave it a lovely chewy meaty texture and I’d definitely make this meal again. Sunday was not quite as succesful but no major disasters. 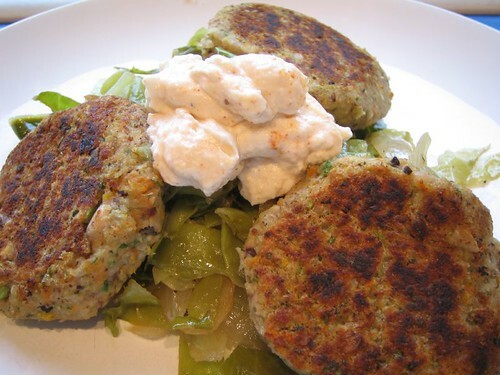 First up was a brunch dish – Hoppin’ John fritters with smoky greens and cayenne aoli. The fritters were full of tasty ingredients but I don’t think I let them sit for long enough as the flavours just didn’t come through. Next time I’d make them the night before. There was nothing at all wrong with the dish but it just didn’t pack the punch that I’d expected. 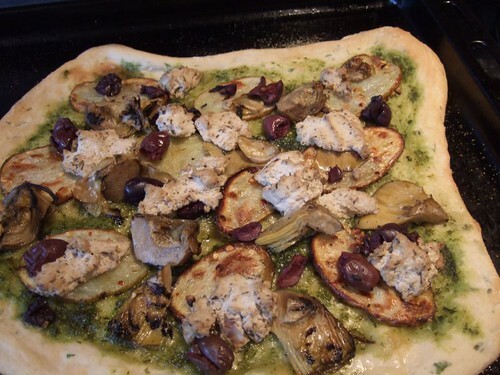 Finally we had artichoke, potato and kalamata pizza. It used a herbed dough but I’d never have known there were herbs in it. Still at least the dough worked – last time I made pizza dough it was a complete disaster and I’d been put off it for a while. The toppings were pesto, roasted sliced potatoes, olives, artichokes and goats cheese. I substituted the goats cheese for the tofu ricotta. This was the real problem I think. The texture was good but it just wasn’t tasty enough. it needed a good dose of nutritional yeast and or lemon, I think. But the rest of the pizza was good – it just lacked a little zinginess. So all together choosing one cookbook and sticking to it worked well. I’ve got to know the style of the book and feel as though I’ve got my money’s worth out of it. Why don’t you try picking a neglected book from your collection and try it?